Dwain Chambers, who turned 40 in April, has an all-time best of 9.97 in the 100 and a doping scandal to overcome. 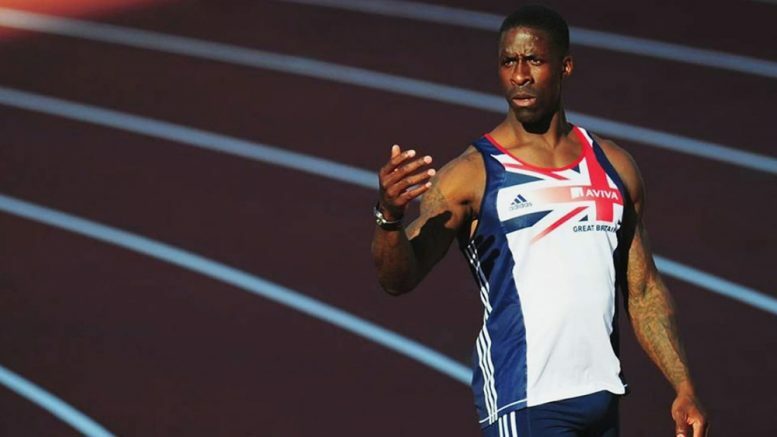 Results haven’t been posted (headed here eventually or on the Powers of 10 page), but Darren Scott’s latest Masters Grand Prix meet Sunday at London’s Lee Valley track apparently saw a world record in the M40 4×100 — anchored by world champion Dwain Chambers. The reported time of 42.17 by Jason “Juggler” Carty, Dominic Jon, Mensah Elliott and Dwain nips the listed WR of 42.20 by the American team of Frank Strong, Cornell Stephenson, Kettrell Berry and Willie Gault in 2004. Dwain isn’t listed in the Malaga entries. At least he doesn’t have to worry about being drug-tested in Spain. In 2003, he drew a two-year doping suspension and was banned from the Olympics for life, according to this Guardian story. 3 Comments on "Dwain Chambers-anchored Brit 4×1 relay claims WR from Willie Gault’s M40 team"
I was told yesterday that the official time has been rounded up to 42.18.